How does it feel when your project finally gets stamped as completed and your clients can enjoy their beautiful new or newly remodeled home? That sense of relief and accomplishment means a lot to the morale of a company and its team. HBA Staff is looking for new ways to communicate all that we as an Association experience and accomplish in a month's time. As a result, the last Friday of each month will bring a new e-blast that we are calling "The C.O." to represent the completion of a large project that really is a lot of small pieces accomplished by a wide variety of contributors. Join us throughout the rest of 2018 with your comments, suggestions and even your own accomplishments throughout the previous month. Submissions can be made to info@hhahba.com prior to the last Friday of the month. The before and after photos of HBA Member Savannah Blinds Shutters and Shades new showroom are truly remarkable. A great job done by the team at Savannah Blinds Shutters and Shades along with their interior design partner, Autumn Kirk of The Curated Life. The goal of the HBA is to build relationships between building industry businesses just like Savannah Blinds Shutters and Shades and The Curated Life along with members of the community, public officials and more through advocacy, education, networking and beyond. These partnerships are much like the Savannah Blinds Shutters and Shades showroom before and after its renovation, transformative for your business. Feel free to share your own recent transformative experience that has helped shape your business by emailing info@hhahba.com today! For more information on Savannah Blinds Shutters and Shades or The Curated Life, visit their websites today! Do you have expert advice to share for others in your industry and for the community as a whole? The HBA is looking for guest bloggers for the HBA website! From now until the end of 2018, HBA Staff will be offering up the HBA blog for YOUR tips and tricks of the trade at no cost to you. Simply send your blog post along with any image or video files you would like included and we will add it to the HBA Blog here. Let us help promote your business to your fellow HBA members! Any interested parties are welcomed to email info@hhahba.com for inclusion in the HBA blog or for more information on the HBA guest blogger program. Over 100 HBA members in attendance at the first Member Appreciation Night of the year on 5/1 hosted by Ferguson in partnership with Cambria. To view all of the photos from the Member Appreciation event at Ferguson, visit the HBA Facebook page. $38,500 in scholarships given to 11 worthy high school seniors from 9 of 15 Beaufort and Jasper County High Schools! Members of the Hilton Head Area Home Builders Association and the Community came together Wed, May 16 for the organization’s Annual presentation of its Education Foundation Scholarship Awards Banquet. For nearly thirty years, the Hilton Head Home Builders Education Foundation has been awarding scholarships to local graduating seniors. Eleven college-bound students from high schools within Beaufort and Jasper Counties, each received a $3,500 scholarship for their academic performance, demonstrated leadership, financial need, and commitment to community. 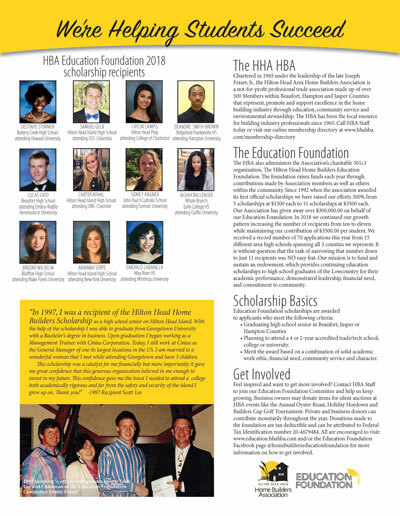 The Association’s charitable 501(c)(3) foundation, The Hilton Head Home Builders Education Foundation, raises scholarship funds each year through contributions made by Association members, as well as others within the community. The Foundation’s fundraising goals continue to increase each year in the hopes of awarding more scholarships to deserving students in Beaufort, Jasper and Hampton Counties. In 2018, the Education Foundation Committee was proud to award eleven $3,500 scholarships to local high school seniors, an increase of 300% from when the very first scholarships were awarded in 1992. The Education Foundation was able to award additional scholarships due to contributions by: Chris Dalzell of Shoreline Construction & Development, Dave Gaal of Gaal Custom Homes & Remodeling, LLC, Brian Quinn of The Twelve Oaks Group, Spartina 449, The Sandbar, Fat Patties, Brantley King of Billy Wood Appliance, Susan Goodridge of BB&T, Randy and Brenda Jeffcoat of Randy Jeffcoat Builders, The Grayco, Inc Family, Jim Ryder of Thomas Concrete of South Carolina, Inc., Joe Nix of Nix Construction Company, Inc., and finally, Education Foundation Banquet Sponsors Brian and Leslie Esposito of Esposito Construction, Inc.
Missy Mallick-Northwest Exterminating Co., Inc.
To view more photos from the 2018 Education Foundation banquet, visit the HBA Facebook Page. For all of your weekly permit data needs in Beaufort or Jasper Counties, call on HBA member Construction Week. To learn more about Construction Week, visit their website here or email Paul Wachter at pwachterwp56@gmail.com. Great news! The South Carolina Public Service Commission (PSC) has approved the HBASC petition to intervene on a proposed tax multiplier for utilities with the aid in construction. The PSC also suspended their order to charge the tax multiplier until oral arguments can be heard. NAHB members from throughout the United States attended a briefing with Vice President Mike Pence during time in Washington D.C. Members expressed concerns regarding softwood lumber and aluminum/steel tariffs but praised leadership for their role in tax reform. The HBA Executive Committee met with SC State Legislature incumbent Jeff Bradley to present him with an endorsement from the Home Builders Association. As a friend of the building industry, we wish Representative Bradley the best in his reelection. Finally, enjoy a safe Memorial Day weekend all while remembering the sacrifices made by those who served the United States of America with great courage. The HBA Office will be closed in recognition of Memorial Day on Monday, May 28 but will reopen at 9:00 am on Tuesday, May 29. If you have any immediate concerns, please contact Executive Officer Meg James via 843-304-6808. RSVP to Katie via katie@treehousetechnologygroup.com by May 29. Education, Networking with HBA members across South Carolina and more!